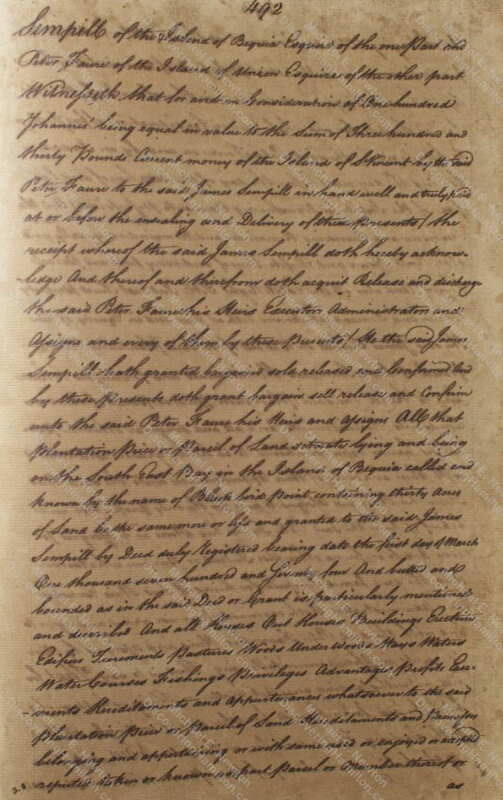 What Happened to Alexander Hamilton’s Father? 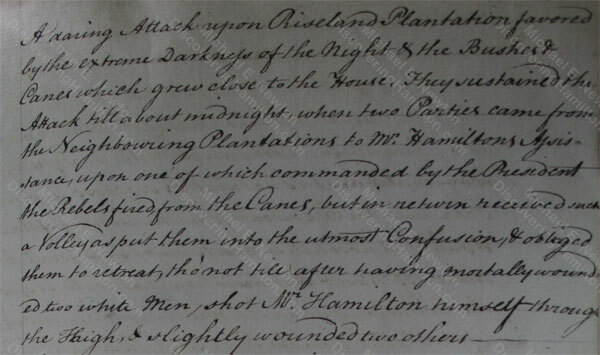 The Story of James Hamilton from 1766–1799. 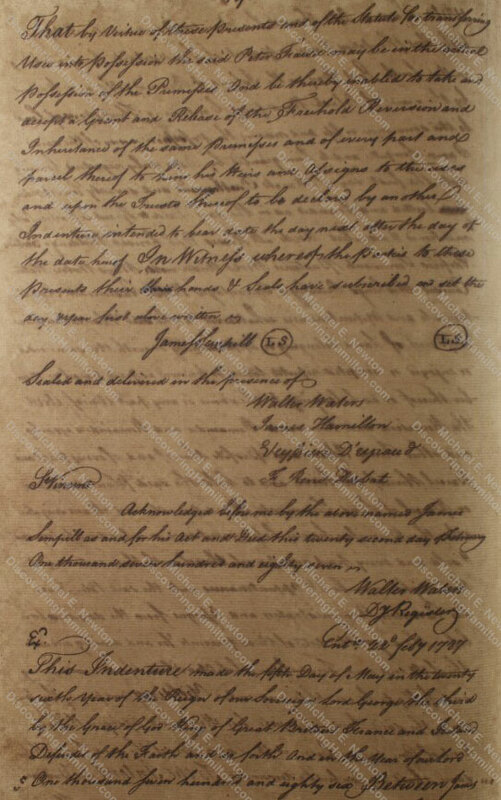 After his appearance as a witness to a legal document on June 25, 1766, James Hamilton disappears from the known extant records of St. Croix. 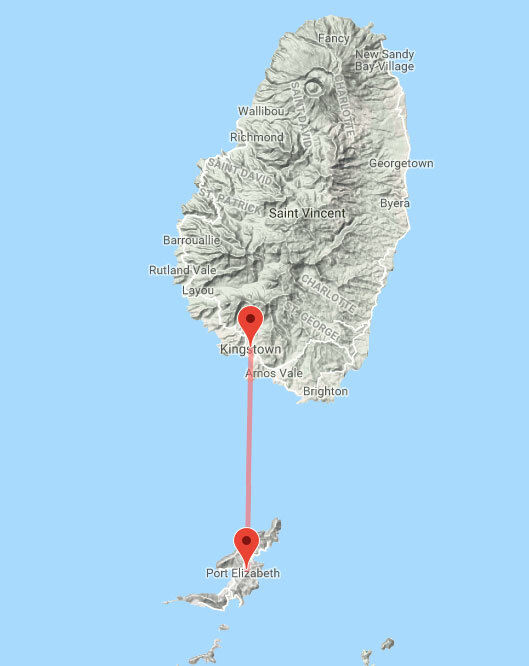 The date of his departure from St. Croix is not known, but he must have left the island prior to February 1768 when Rachel Faucett died and their children—James Jr. and Alexander Hamilton—were taken in by the Lyttons. 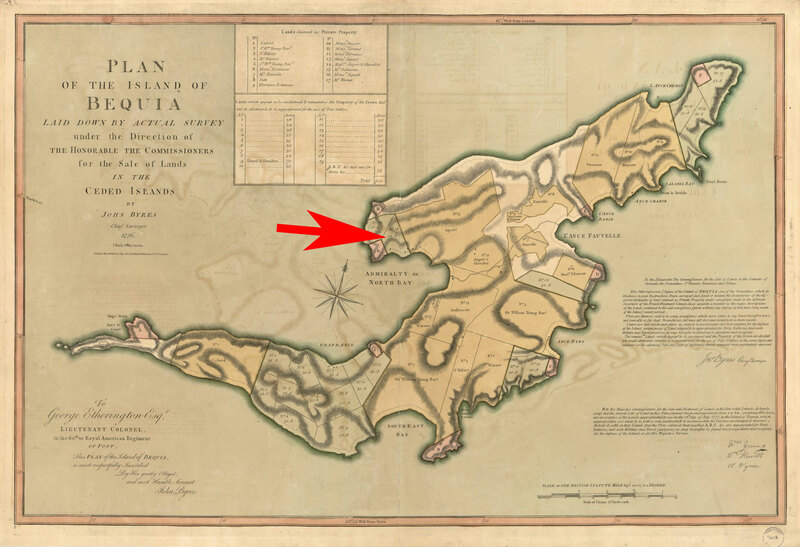 On January 23, 1771, The Royal Danish American Gazette on St. Croix reported that on the island of Tobago, more than five hundred miles to the south, “the slaves of the Coramantie nation, about 30 in number, . 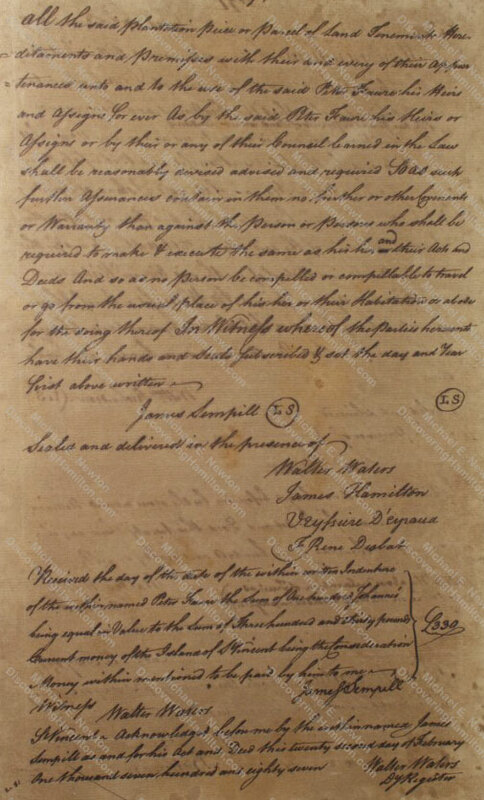 . . attacked Mr. Hamilton’s house” and “wounded three white men desperately, two of whom are since dead. 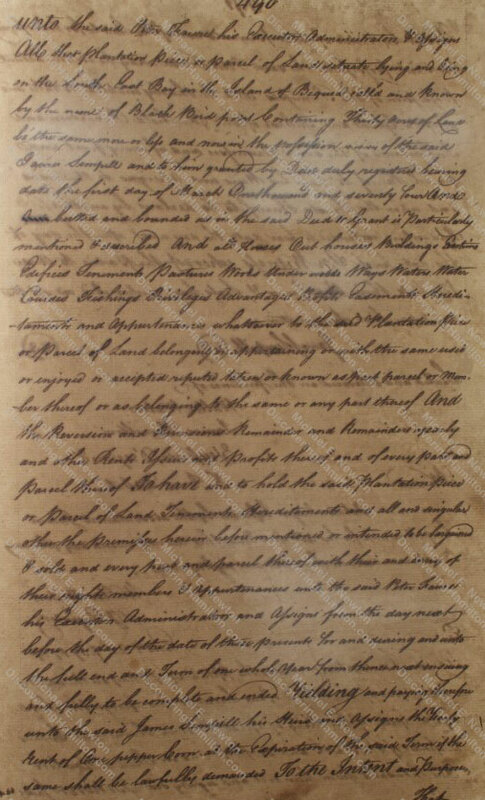 Mr. Hamilton was shot through the thigh, but is recovering.” Alexander Hamilton must have read this report in the paper. 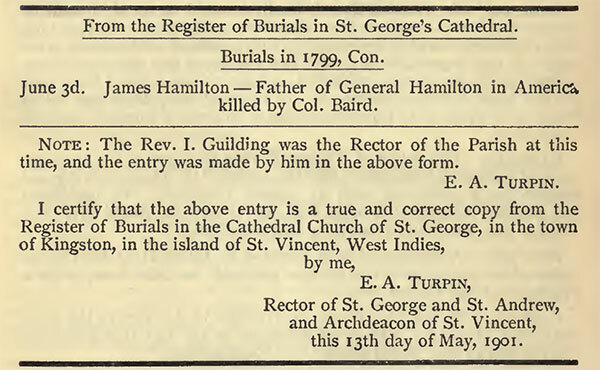 It is often said that this may have been Alexander Hamilton’s father, whose whereabouts at this time are not known. 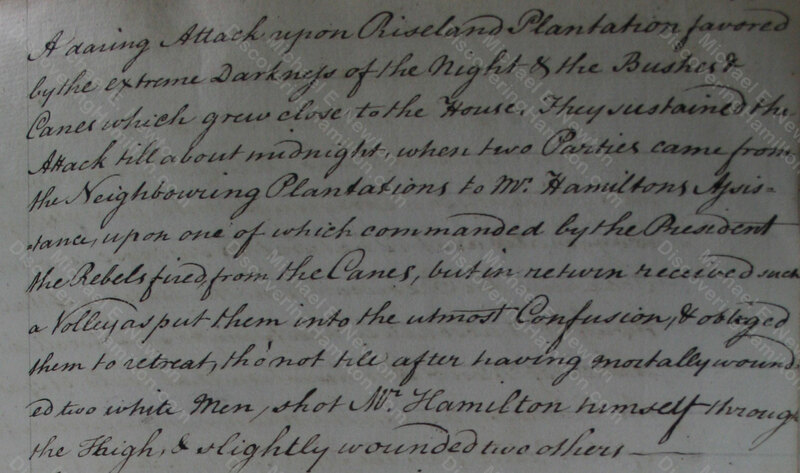 But this was not James Hamilton. Instead, the injured “Mr. Hamilton” apparently was John Hamilton, the owner of an estate in Riseland, Tobago. 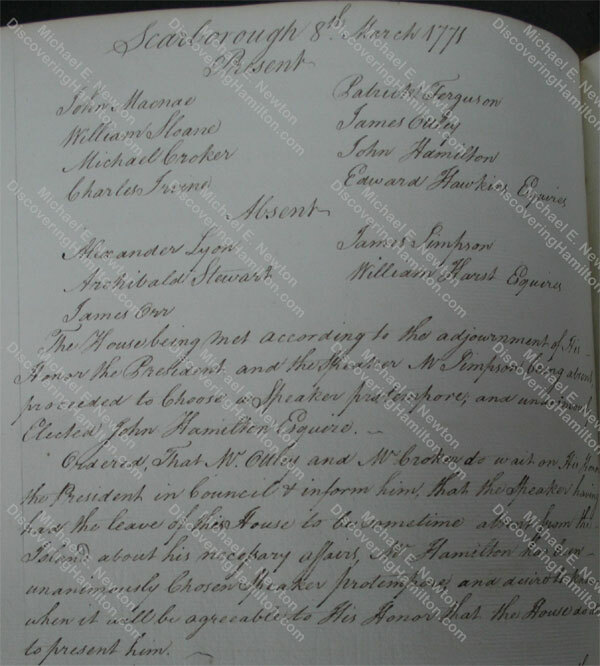 Although no first name is ever given for the “Mr. 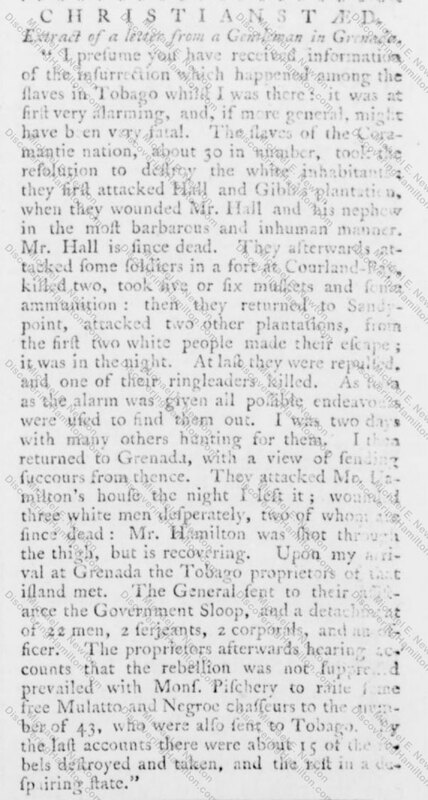 Hamilton” who was injured, that is because John Hamilton was a prominent person on Tobago, a member of the Assembly and Council, and everyone knew that “Mr. 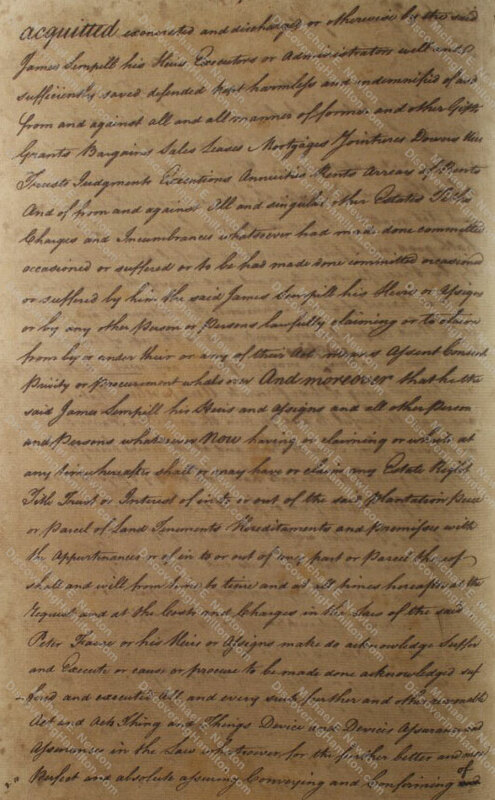 Hamilton” referred to John Hamilton. Moreover, only John Hamilton is known to have owned an estate in Riseland. 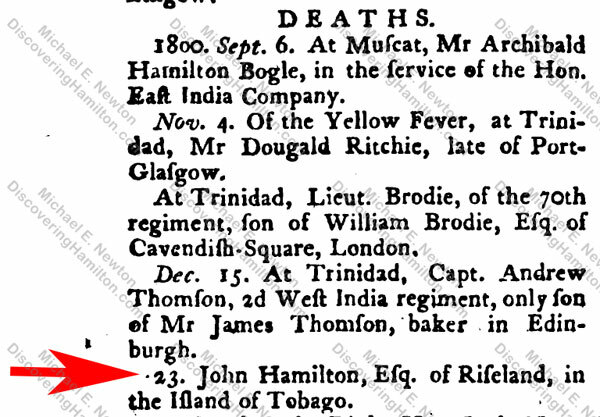 Furthermore, there is no evidence that James Hamilton ever set foot on Tobago. 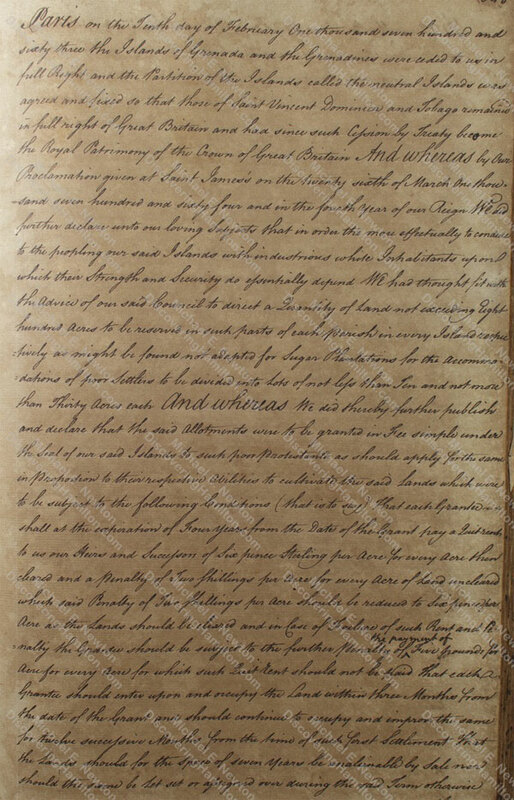 * I would like to thank Susan Moore (www.susanmooreresearch.co.uk) for locating and photographing at my request the above documents within the collections of the U.K. National Archives. 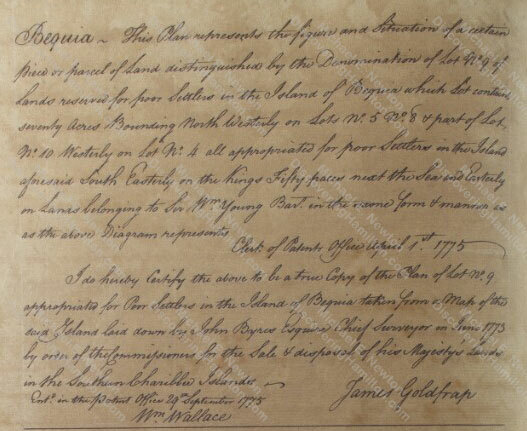 By 1774, James Hamilton had moved to Bequia, the northernmost and second largest island of the Grenadine Islands. 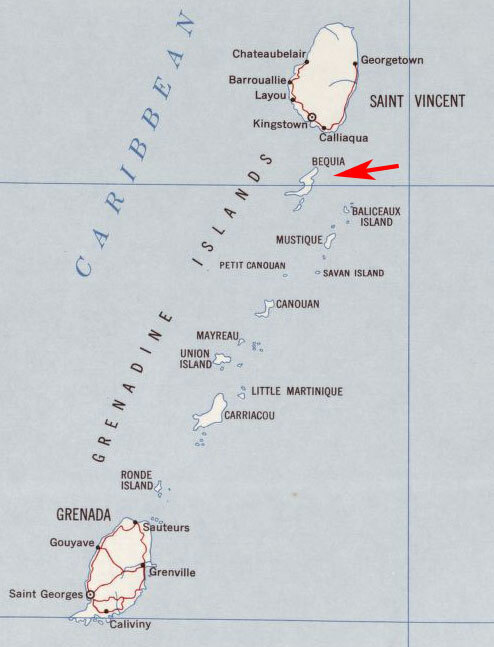 Just seven square miles in size, Bequia sits about 400 miles south-southeast of St. Croix. 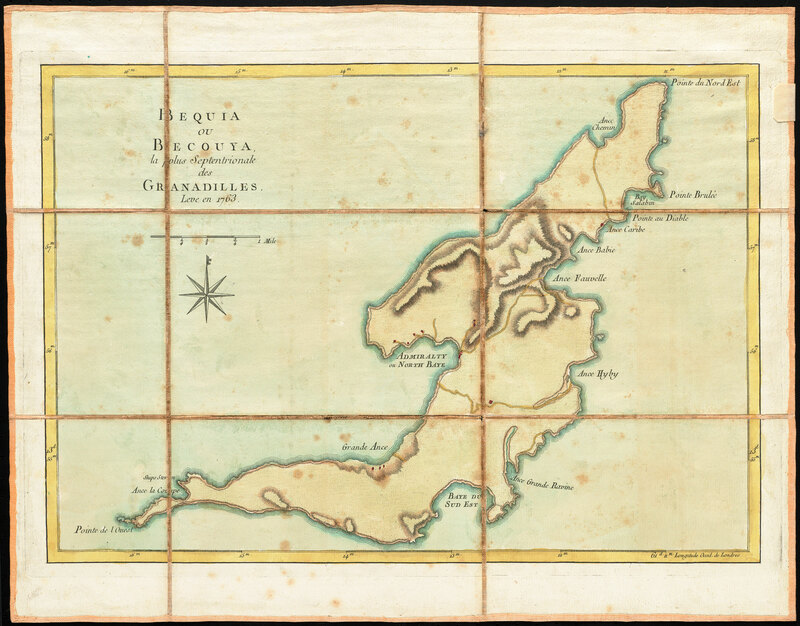 It was described at the time as “a beautiful and most healthy island” but “deficient in rivers essential to the comfort and satisfaction” of its inhabitants. 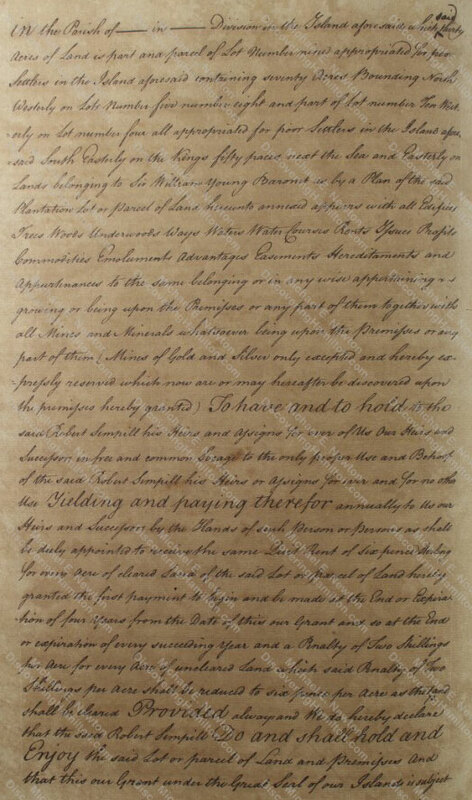 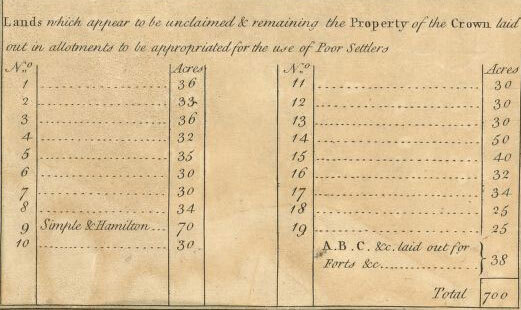 On March 1, 1774, James Hamilton acquired Lot No. 18 on Bequia, a 25-acre parcel of land that had been “reserved for poor settlers” on the north shore of the Admiralty or North Bay. By 1776, according to a map produced that year, James Hamilton had at least three buildings on his property, but these three structures seem to be the same ones that are shown on a 1763 map of the island. But this map appears to be mistaken. 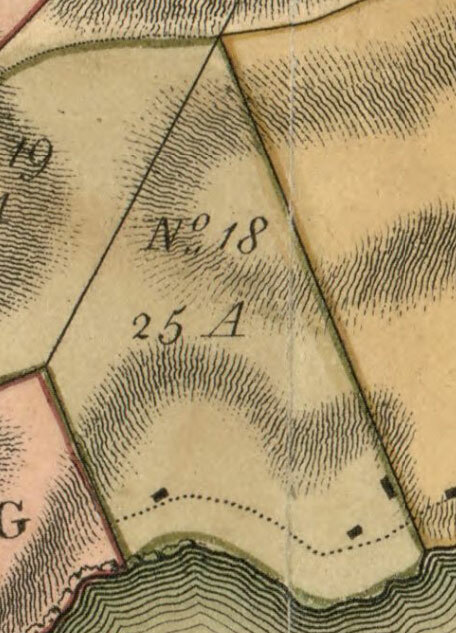 Thirty of No. 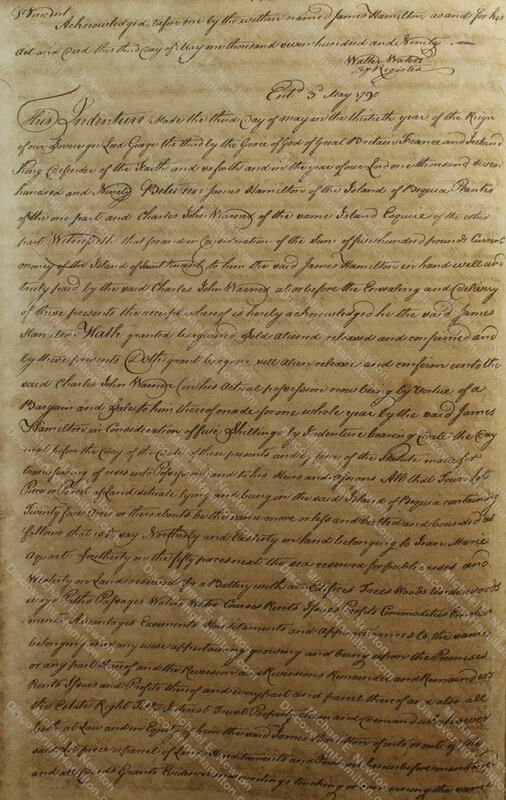 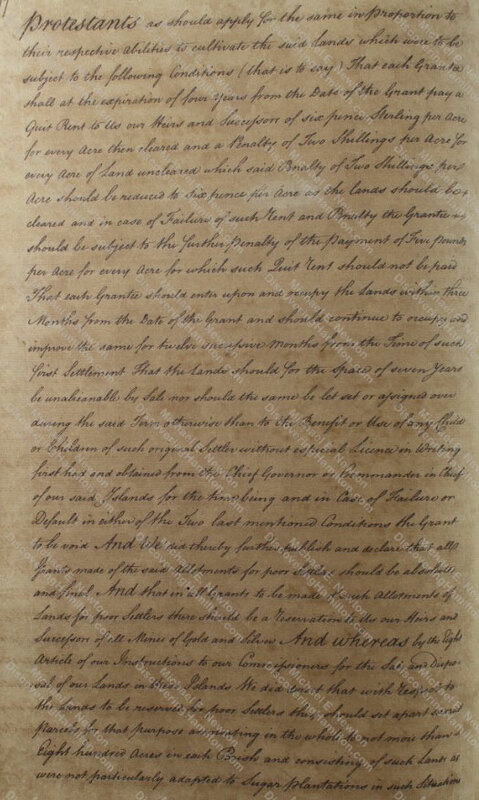 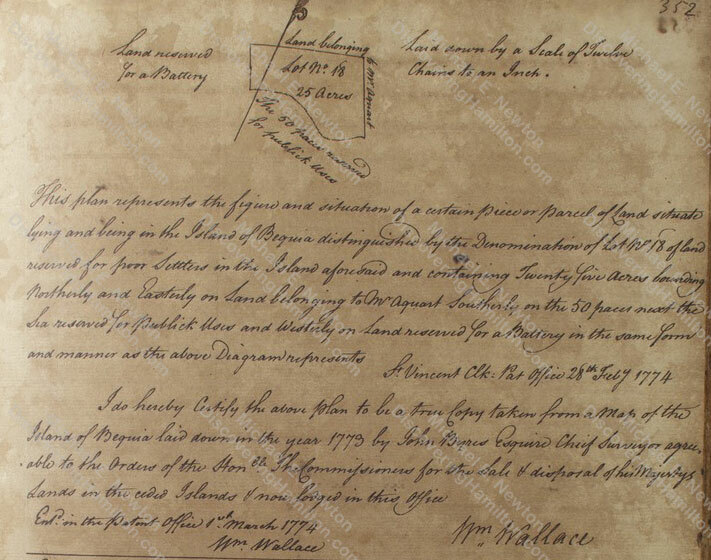 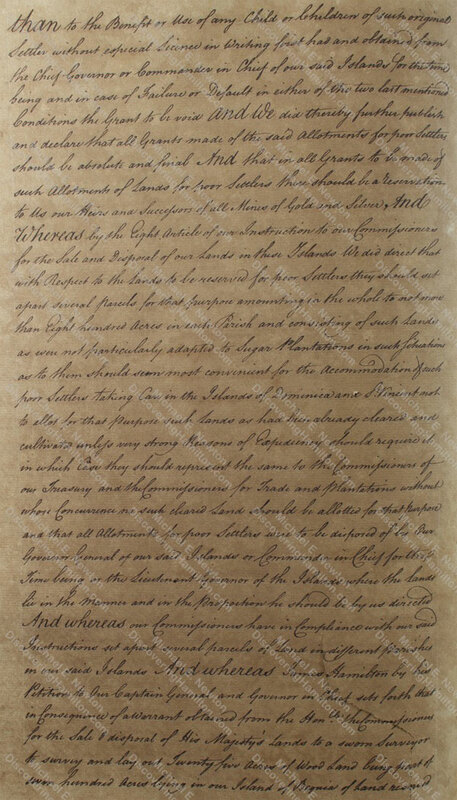 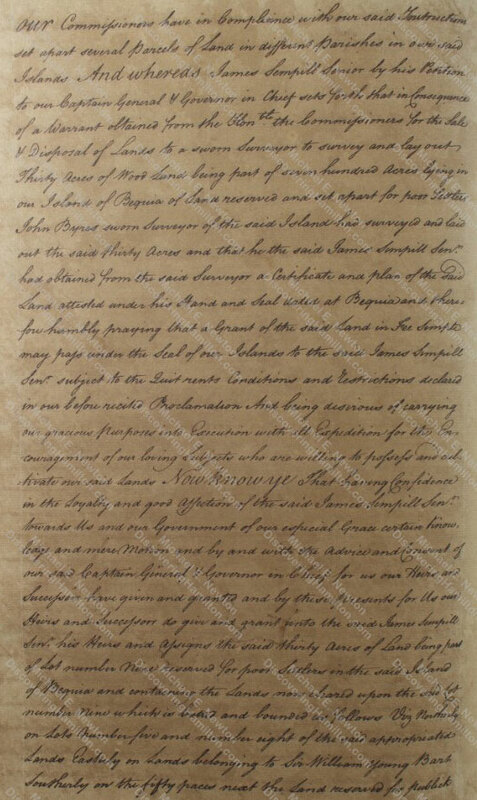 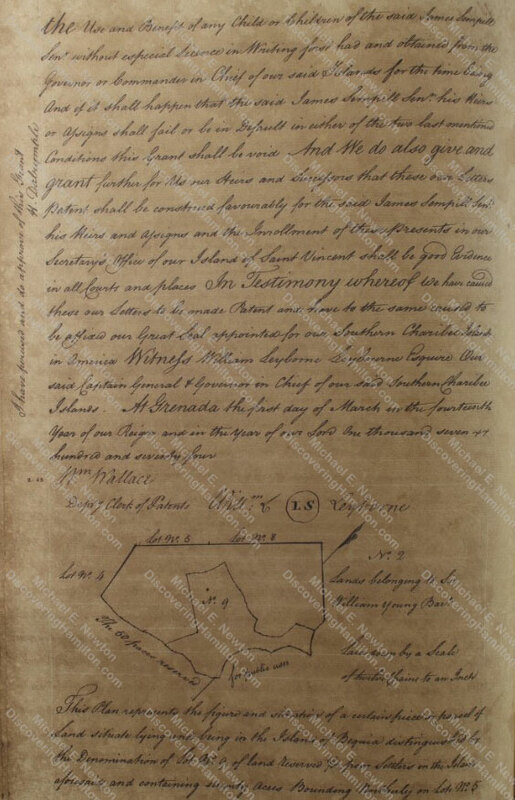 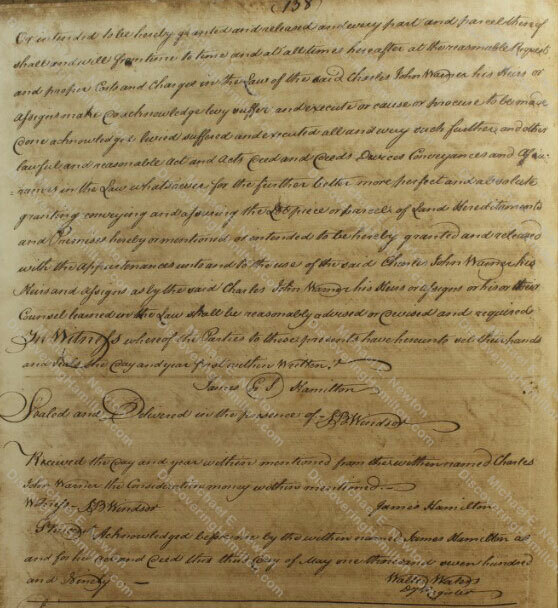 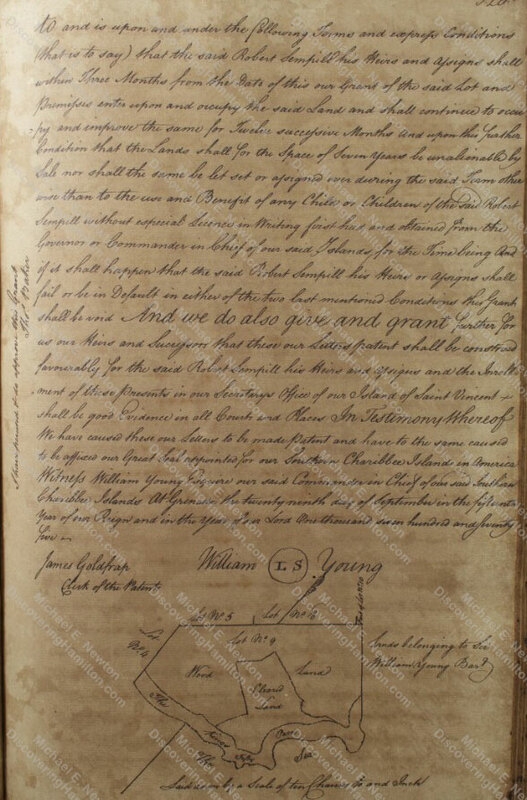 9’s seventy acres were granted to James Sempill in March 1774 and another thirty acres were granted to Robert Sempill in April 1775 with the remainder belonging to the King for public use. 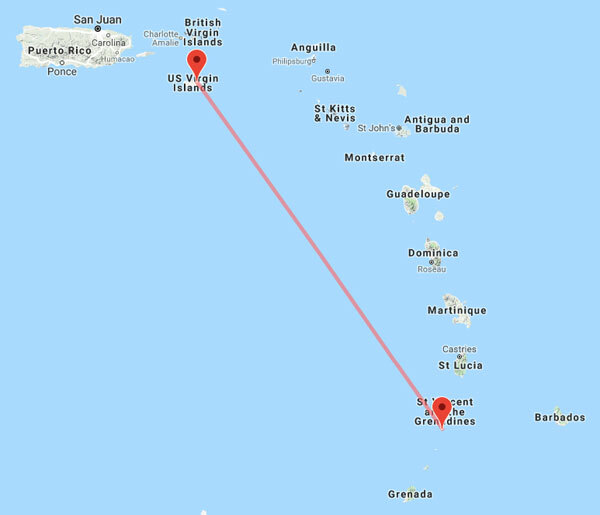 James Hamilton at this time took his money, left Bequia, and moved about ten miles northward to the larger island of St. Vincent. 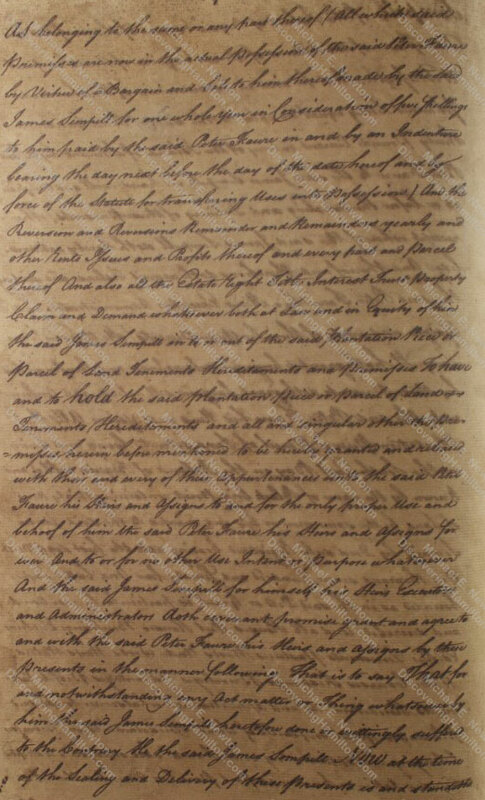 On June 12, 1793, James Hamilton wrote to his son, Alexander Hamilton, from St. Vincent. 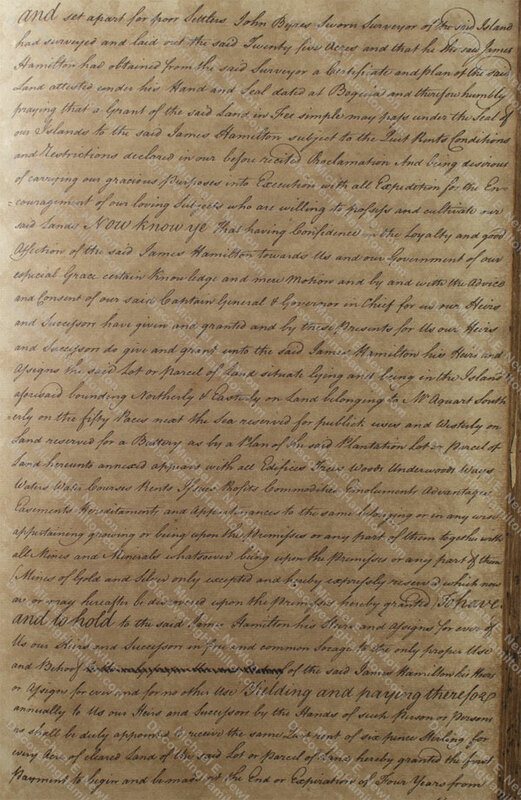 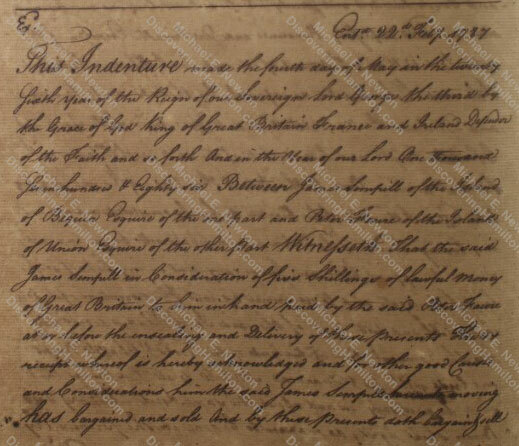 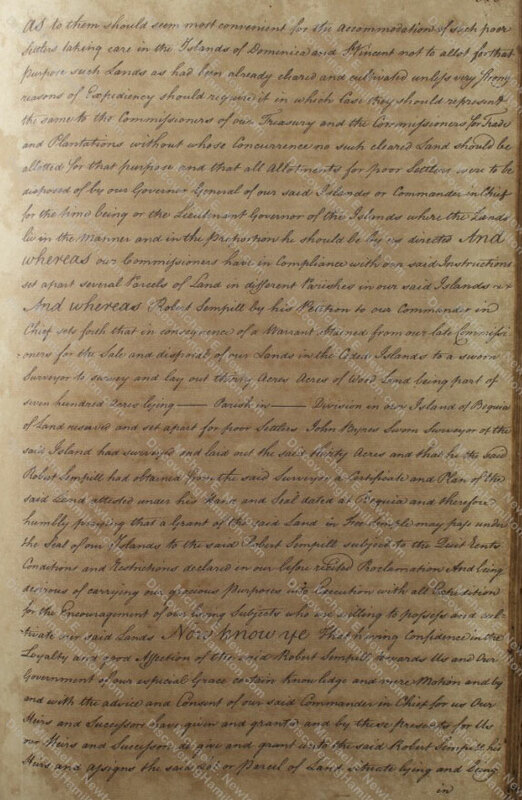 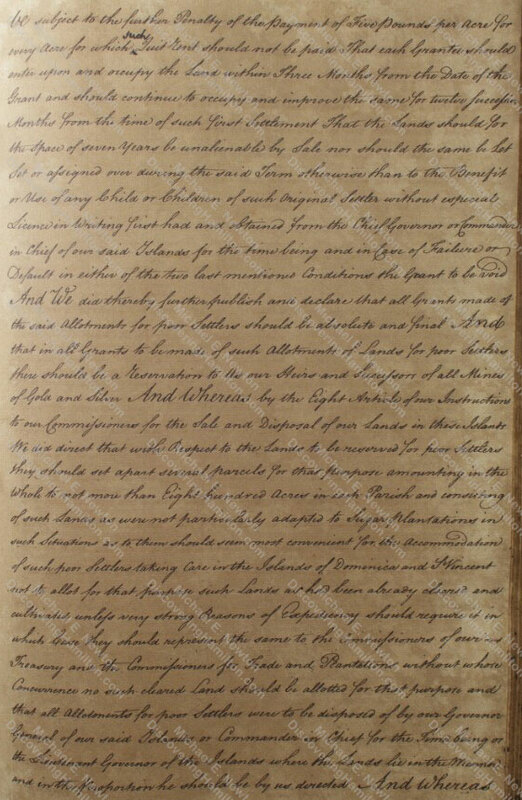 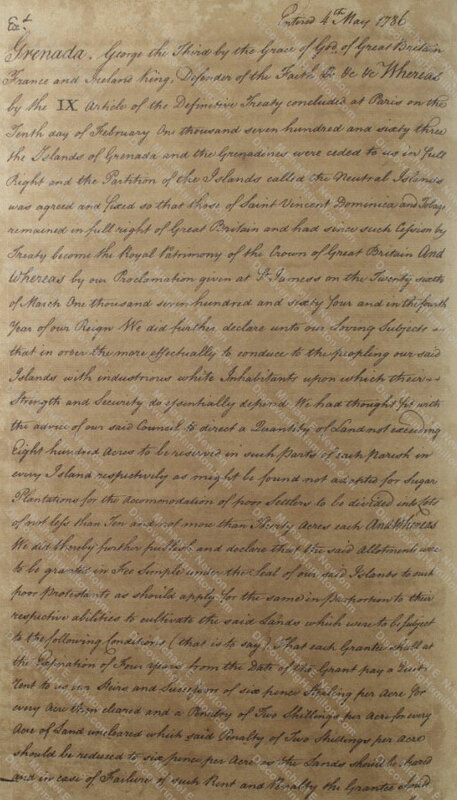 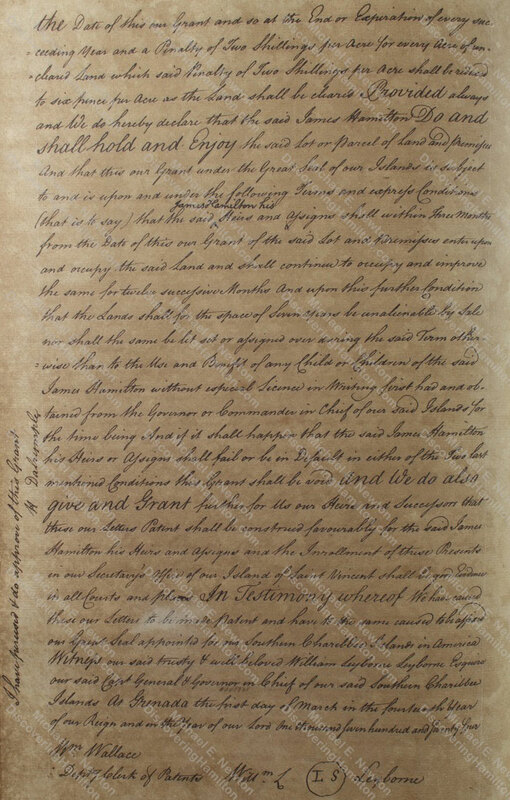 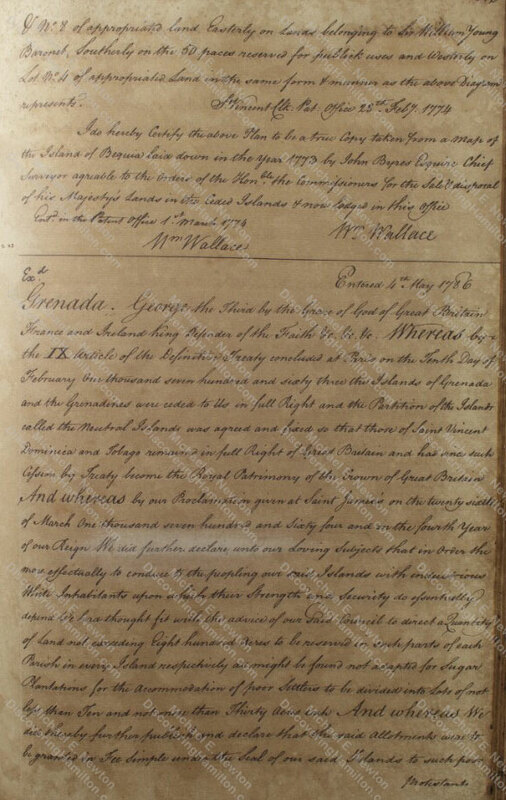 Having sold his property on Bequia, James had hoped to join his son on the mainland, but explained that “my bad State of health has prevented my going to Sea at this time being afflicted with a complication of disorders.” On top of this, “the war which has lately broke out between France & England makes it very dengerous going to Sea at this time.” Still, James hoped that peace would soon arrive and “provided it is not too late in the Season I will embark in the first Vessel that Sails for Philadelphia.” This is the only known extant letter from James Hamilton Sr. to Alexander Hamilton. 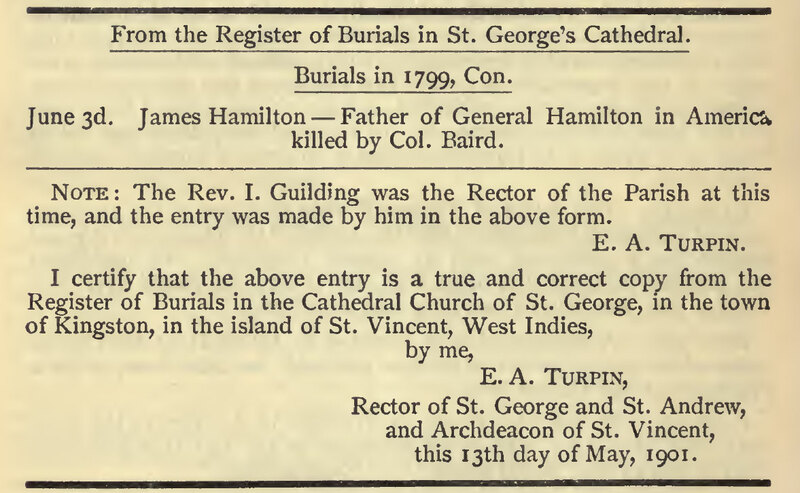 James Hamilton, the father of Alexander Hamilton, passed away on St. Vincent in 1799 and was buried in St. George’s Cathedral in Kingstown on June 3 of that year. 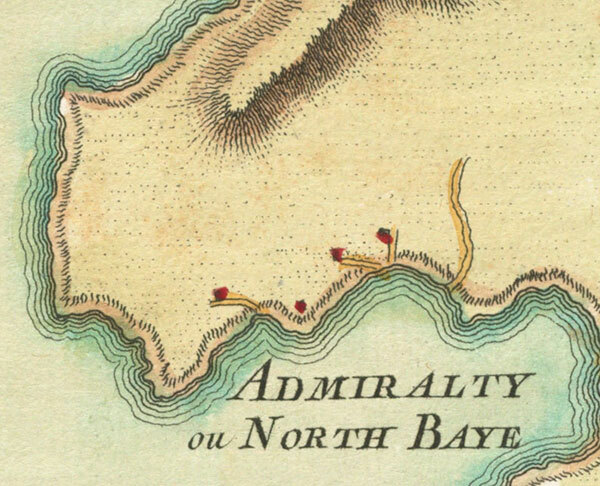 On July 13, I will be presenting my biggest discovery to date! For instance, see H. U. Ramsing, “Alexander Hamilton og hans Mødrene Slaegt”; Mitchell, Alexander Hamilton: Youth to Maturity 13–14. 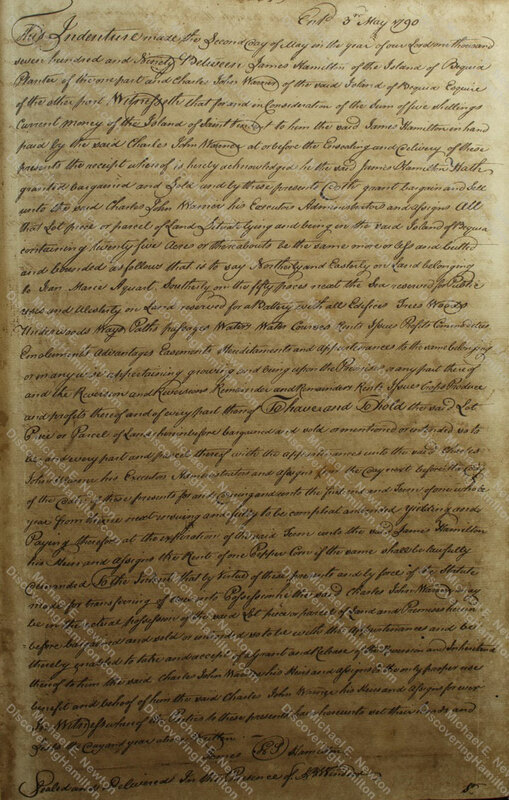 ; Randall, Alexander Hamilton: A Life 20. 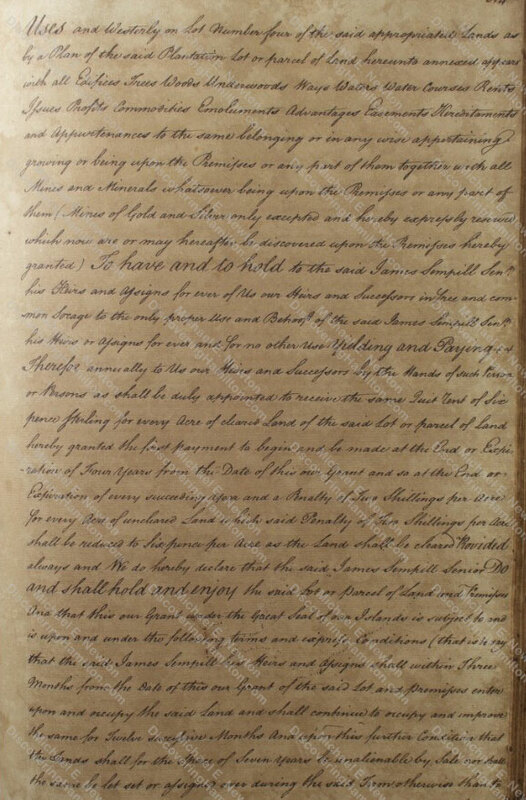 Young, An Account of the Black Charaibs 29. 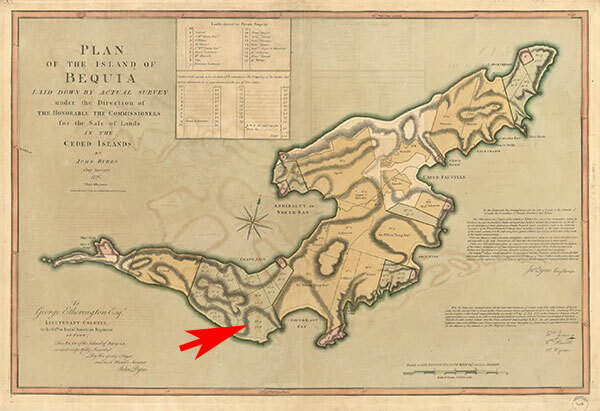 Chernow, who first wrote about James Hamilton on Bequia, did not notice this error and wrote that James Hamilton shared “seventy acres with a man named Simple” (Chernow, Alexander Hamilton 40 and 734). 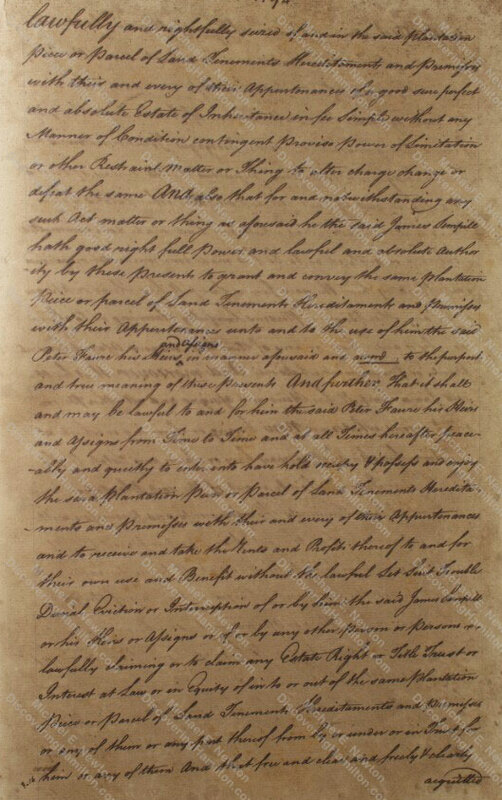 James Hamilton to Alexander Hamilton, June 12, 1793, in The Papers of Alexander Hamilton 14:536–537. 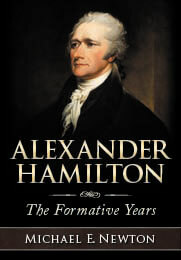 Newton, Alexander Hamilton: The Formative Years 529 note 131. 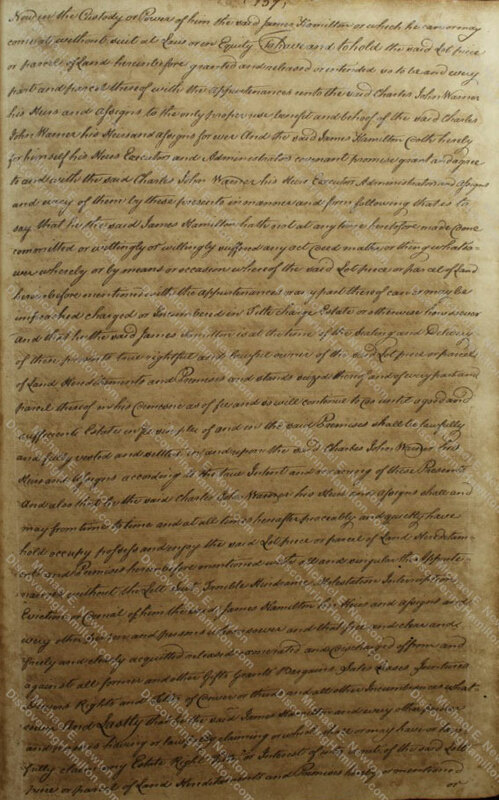 Alexander Hamilton, addressed to William Jackson but sent to James McHenry, August 26, 1800, in The Papers of Alexander Hamilton 25:89. 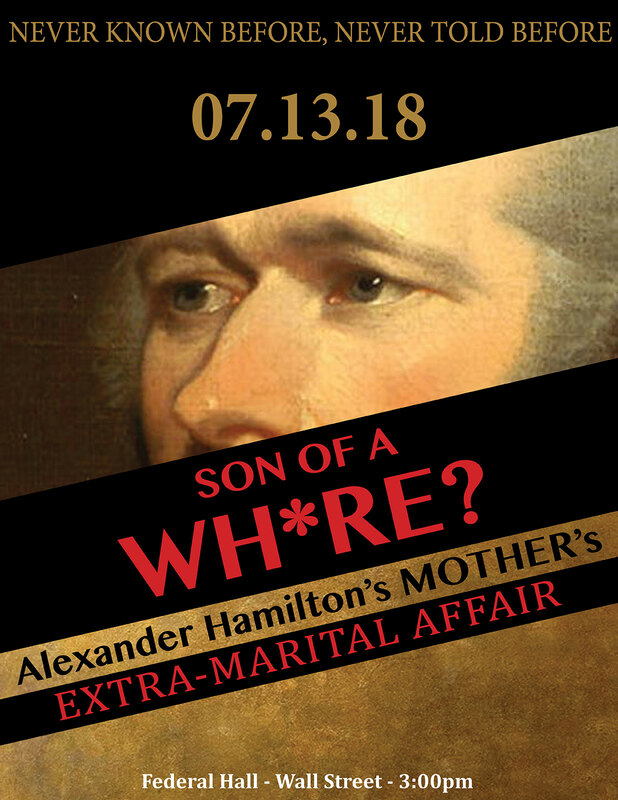 © Posted on June 25, 2018, by Michael E. Newton. 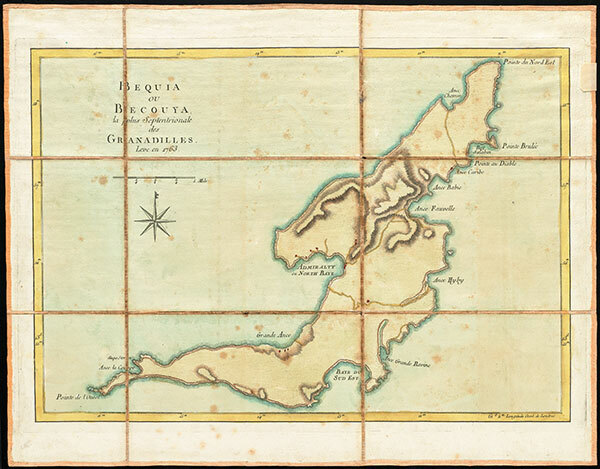 Please cite this blog post when writing about these new discoveries.